This is a rather unusual mark that has only been found on a few specific rifles at present. The true meaning of this mark is unknown, as is if it is really a Spanish mark. However the only rifles it has been found on do display Spanish Civil War characteristics. The first example of this mark is on a 1936 date Izhevsk M1891/30 rifle. The rifle itself has several Spanish specific markings, including a "Made in USSR" stamp. It also has the controversial "Dice Mark", which has not been 100% confirmed as a Spanish marking. Another example of this mark was found on a 1936 dated Tula M1891/30 stock. The actual rifle in the stock is a 1922 dated Tula M1891 rifle. This strange combination may actually be original, as the receiver of the M1891 has a "Made in URRS" marking on it. The "Sun" marking is found in the exact same area as the previously mentioned example. The "Sun" stamp appears on the wrist of the hand grip, right behind the rear of the trigger guard. It is made up of seven to eight tiny triangles formed in a manner that makes them appear as if they are rays of sun. The true meaning of this mark is unknown, as is it's true origin. It is not uncommon for individuals to add their own "touch" to a rifle and this mark could very well have been done stateside. In any case it is a very interesting and unique mark that has yet to be found on other Mosin Nagant rifles. The following information was provided by "davec" of the 7.62x54r.net forums. While not a 100% verifiable explanation of the "Sun" mark, it offers a very interesting possibility! 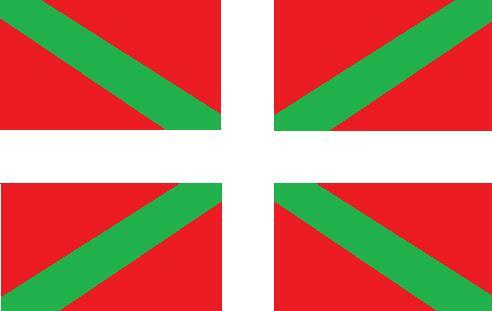 "While I have not seen any documentation about it, my speculative hunch is that it is actually the ikurriña, the flag of the Basque country but rendered as a roundel." "This flag was formally adopted in 1936 on the eve of the Nationalist rebellion against the Republic. The Basques, while socially conservative and very devoutly Catholic, nonetheless sympathized with the prospect of greater regional autonomy within the Republic, and typically were opposed to the Nationalist program of centralized control. As a result, very many Basques fought with the Republican forces. I have seen lots of black and white photographs, and in a British publication, there was an image of a soldier with an arm band or brassard that the caption identified as the Union Jack and implied the soldier must therefore have been British. But while the ikurriña does look a bit like the Union Jack, especially in black and white photographs, it does not have the stripe in the center of the white cross the way the UK emblem does. Also, the green cross is a bit darker in photos. Anyhow, my hunch is that the so-called "star mark" is just a means of portraying the ikurriña as a roundel." Thank you 'davec' for this interesting theory on the meaning of this rather obscure and uncommon mark!